Joining is simple. At each Monthly Meeting there is a special table set aside for potential new members to discuss membership. Application forms are available at that table and anyone joining receives a new member’s pack containing information leaflets and a copy off the latest Newsletter. The membership application form has been revised to comply with the new General Data Protection Regulation (GDPR) which will apply from 25th May 2018 in the United Kingdom and is an update to the Data Protection Act 1998 (DPA). 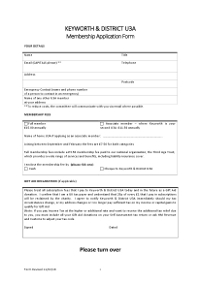 You can print a copy of the membership application form from this site, follow this link: membership application form. Please note the form has 2 sides. Most printers will have the facility to print double sided but don't worry if you have to print on two sheets. Membership costs £15.00 for the year 1st March 2019 to 28th February 2020. New members joining between 1st September and 28th February pay a reduced fee of £7.50, with the exception of lapsed members (people who did not renew at the end of the previous membership year) who pay the full membership fee if they rejoin. If you are already an existing member of another U3A please let us know and deduct the £3.50 Third Age Trust Membership Fee from your payment. In May 2018 new Data Protection regulations come into force called the General Data Protection Regulation (GDPR). In essence we now have to have your specific agreement to hold your information digitally. That information includes your name, address, telephone number, email address and an emergency contact. No other information is held and this information will NEVER be given to a third party or used for anything other thanfor the administration of Keyworth & District U3A. In the past our membership and renewal forms have asked you to opt-out if you did not want the above information held digitally. The fundamental change as a result of GDPR is that you now have to OPT-IN by giving your express permission for the information to be held by us. 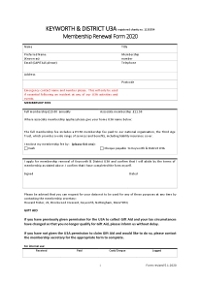 You can print a copy of the renewal form from this site - membership renewal form - and it must accompany your subscription renewal payment. Please note the form has 2 sides. Most printers will have the facility to print double sided but don't worry if you have to print on two sheets. The committee is sorry that we have to make this insistant but is sure thet you will understanbd that it is essential for us to comply with the new data protection regulations and is in your best interests. You can find more information on the National Office website under Advice/Data Protection (which is in the members area, login needed). 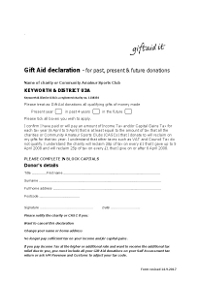 Keyworth & District U3A would very much appreciate eligible members signing a Gift Aid declaration. This allows us to recover money from the Inland Revenue and consequently assist in our funds. To be eligible you must pay an amount of Income Tax and/or Capital Gains Tax for each tax year that is at least equal to the amount of tax that Keyworth & District U3A will reclaim on your subscription for that tax year. This is 25p of tax for every £1 of your subscription on or after 6 April 2008. If you pay income tax at a higher rate, you must include all your Gift Aid donations on your Self Assessment tax return if you want to receive the additional tax relief due to you. Non-Members are invited to attend one Monthly Meeting as a guest but must thereafter join to be entitled to attend further meetings. Membership of a Group is conditional upon being a full member of Keyworth & District U3A. Potential members of a group should contact the Group Leader whose details are given in each Newsletter and in the Interest Groups section of the website to ascertain whether places are available in the group and to obtain other details. New members are given a paper copy of the latest Interest Groups Booklet which can also be accessed on the website in the Documents section under 'Reference'. Keyworth & District U3A issues a monthly electronic Newsletter to members. This is emailed to those members with an email address, those without an email address receive a paper copy. Back copies are available in the Newsletters and Documents section. New Joiners are given a paper copy of our Information Booklet which contains Interest Group information. Follow the link to view or download. Corrections to the May paper and website versions were added in June 2018. The website version does not have email addresses.